I have a huge list of favourite extensions and apps that I love. My Chrome address bar is now minuscule as the result of me adding so many favourite Chrome extensions to my account. There are only a few extensions in particular however, that I use many times a day without fail. Diigo is definitely one of them. I won't go into that now as I have written about it in the past. Evernote clipper is one I plan on using more often, but funny enough one of my most useful extensions is the seemingly measly little goo.gl shortener. Now there are plenty of shortener extensions and apps out there, but this one has been with me from the on start and it works every single time. 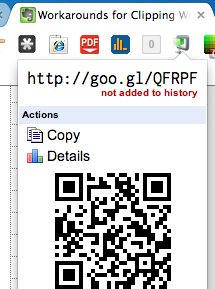 It is not only reliable, but fast and it generates a little QR code along with the shortened URL. It is this QR code that is so important to me. Big deal you might say. QR codes are everywhere, they're certainly not new, so what is the big deal? Timeliness and reliability are both important here. I work on both a Mac and an iPad each day as do our students. Emailing links, or even bookmarking and then accessing them on Diigo (which I love) or tweeting them for example, seems to take too long, too many seconds spent opening up applications. Really, I don't necessarily want these particular links taking up space in my Diigo account etc. Often we need the link in a pinch, while in the midst of a project. At other times we generate them in advance, to use in directing the kids to starter activities, or as components of our online lessons. We use one of my favourite iPad apps, i-nigma, to capture these QR Codes. I have been loving this system for a while and decided that it deserves sharing. Hold on....i-nigma is another application to open up, so why am I whinging about lost time? The question is easily answered by answering another...Why do I love it? It is free, it loads immediately, it is extremely reliable and it captures the QR Code without any kerfuffle. I don't even have to really focus it with the mobile device. I have stood at the front of my classroom and basically waved my iPad across the screen and it captures the code!!! Basically what I do is generate the QR Code on the Mac and open it with i-nigma, that other app I absolutely love to bits. This opens it on the iPad where I can then use it in whatever project we are working on. This is great for working with citations of images the kids may have collected and sharing important links with each other. All you need to do is generate a QR code for the poll, reading selection, video etc, that you are using as a starter and having it up on your computer when the kids come in, ready to capture. I open mine in preview and they zoom very nicely, so even the kids at the back of the room can capture them with ease if needed. Sometimes you may have reason to go off on a tangent and really want to share something with them for later followup or discussion. Just go to the page you want to share. Activate the extension and voila...you have a qr code for them to scan. i-nigma is free for iPad, Android and Windows Phone, and goo.gl shortner is a free extension from the Chrome Store,so there is no reason not to try it out.